Reproduced in the Santa Fe Opera's program booklet this summer is a photo of the August 6, 1945 issue of the Santa Fe New Mexican. Its headline: “Los Alamos Secret Disclosed by Truman.” Los Alamos, the site of the hyper-secretive Manhattan Project that developed the atomic bomb, is just 36 driving miles from New Mexico's capital, Santa Fe, even less from the Santa Fe Opera. 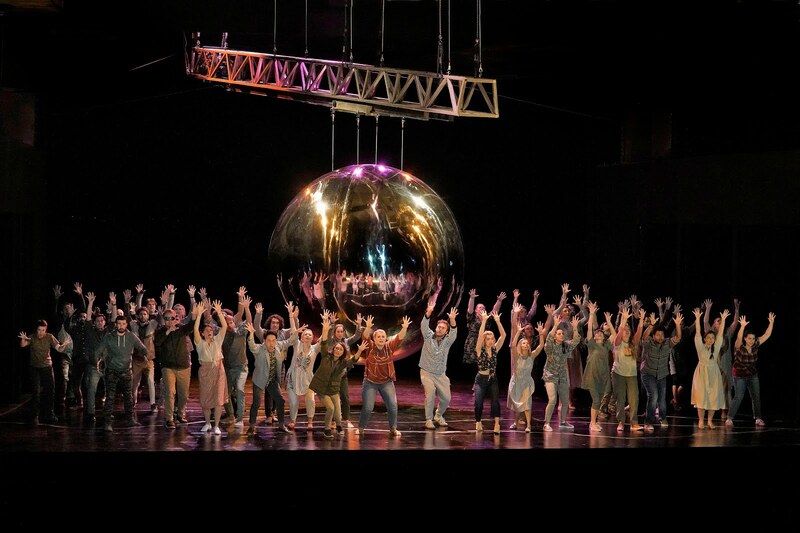 After many years' delay, Doctor Atomic, the John Adams/Peter Sellars opera that explores the lives of those who developed the bomb, finally received its company premiere here. Having two successful libretti for Adams behind her, Goodman began writing Doctor Atomic. However, preliminary drafts reportedly took on the tone of comic-book satire (think Dr. Strangelove), diverging from the psychological realism Adams was aiming for. Goodman resigned the commission. Adams invited Peter Sellars, stage director for his first two operas and designated for this one, to write its libretto. Under time pressure, Sellars used contemporary documents of the actual protagonists, and the literature they liked, to create a series of psychological portraits, shaping them into a drama of the mind, where key characters contemplate what could have turned out for them to be the end of the world. Audience reactions to the premiere of Doctor Atomic at the San Francisco Opera were mixed. The opera has since been considered problematic, if also important. 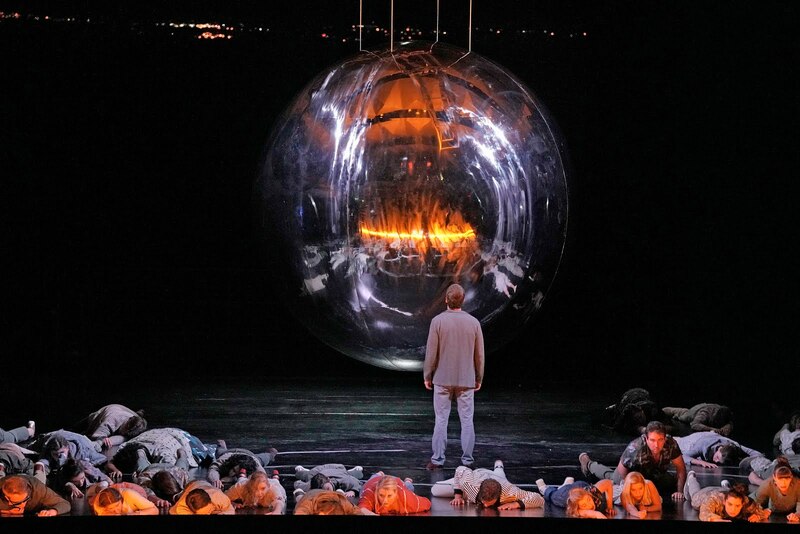 It has been revived, and in 2008 it reached the Metropolitan Opera. Coincident with this current revival at Santa Fe, Nonesuch has released a prestigious CD box, with an introductory essay by L.A. Times music critic Mark Swed, that makes a strong case for the opera. Adams and Sellars have rethought the work, and the staging of it here takes in aspects unique to the Santa Fe locale. The opera centers on Dr. Robert Oppenheimer (who would for the rest of his life carry the moniker “Father of the A-Bomb”) and those close to him. A political liberal, “Oppie” (as he is called in the opera) faces down the moral dilemma of developing the bomb. The argument went that while a couple of swift bomb strikes would regrettably kill many Japanese civilians, it would avoid island-to-island warfare and save the lives of perhaps a million American and Japanese soldiers. Of significance, it would also end the costliest, most destructive war in history. Oppie (McKinny) and Santa Fe Opera Chorus. 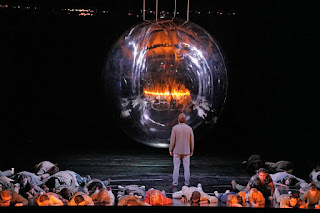 At the performance, the eye was drawn to the set’s singular focal point, a huge dangling and glinting metallic sphere, new for this production, whose symbolic intent will shift from that of an atomic neutron, to the bomb being tested (named “Trinity” by Oppie, after a poem by John Donne), to the anticipated explosion of same, and even probably also to the orb-shaped Earth. The action is conversational, taking place in the 24-hour period before the first test was launched. It shifts between three locales: the work environment at Los Alamos, the nearby Oppenheimer home, and the Trinity test site. 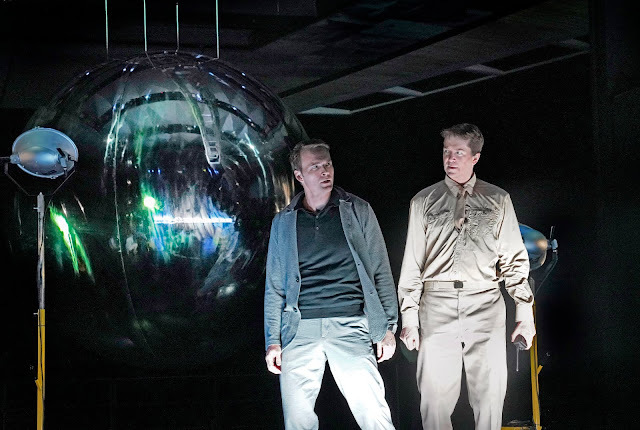 Plangent baritone Ryan McKinny’s Oppenheimer is at the center of the action. 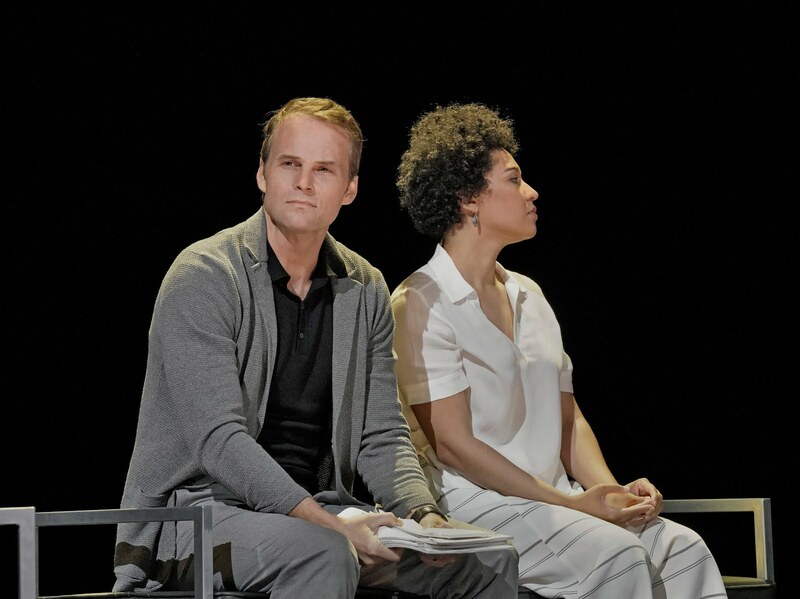 His character switches from conversations with his colleagues to intimacy with wife Kitty (rich-voiced soprano Julia Bullock). Various supernumeraries and dancers inhabit the stage, often it would seem to provide something for the eye to focus on while the cast members ruminate. Oppie (McKinny) with General Groves (Okulitch). More penetratingly, when alone, Oppie ponders the moral dilemma of the enterprise, reciting the words of the John Donne poem, “Batter My Heart, Three-Person'd God.” The Hamlet-Like soliloquy, ostensibly about the Trinity, wonders whether the world we know will continue to be or not to be. Oppenheimer carries a moral choice he knows is consequential, but even his superior scientific mind knows not to what degree. He struggles at this moment to reconcile the unreconcilable. Coming at the end of Act I, it was, for this reviewer, the highlight of the opera. 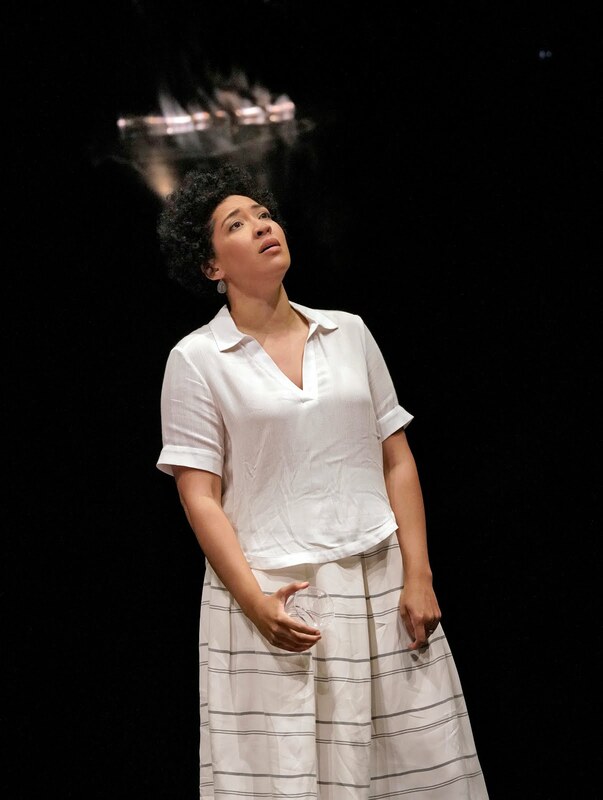 Julia Bullock’s moving portrayal of Kitty sings of her own concerns about war and death, first in an intimate scene with Oppie, then later, in the second act, at home with her children. The Tewa housekeeper Pasqualita (sonorous dark-voiced contralto Meredith Arwady), and Kitty add more forebodings. Particularly touching was Arwady's Native American earth-mother concern for the Oppenheimer boy she cares for. At home, Oppie emotionally unravels as the chorus gives a moving rendition of “At the sight of this,” his hallucinatory vision of Vishnu’s apocalyptic slate of terrors. In the opera’s last uneasy scene of regrets -- this is still before the test bomb has exploded -- Bullock's Kitty urgently renders “We are hopes. You should have hoped us. We are dreams. You should have dreamed us.” It serves as Kitty's effective dramatic counterpart to the John Donne poem that Oppie had sung in the first act. It was the voice not just of a feminine protector, but of all who have no say in the consequential policies and actions of those who govern over them. The opera ends at the test site, those who were to witness the test bomb lying down, peering toward the bomb (cast members at the edge of the stage, looking straight into the audience). Their fearful faces are lit at first with bright ochre tones. Later, after the test bomb’s implied explosion, those faces take on a sickly green reflection, a zombie-like look of death. As they remain transfixed, the eerie recorded voice of a lone Japanese woman, speaking from the aftermath of either the later Hiroshima or Nagasaki explosion, pleads over and over for water. More water. Then, darkness and silence. And time for thought. Together but alone: Robert "Oppie" Oppenheimer (McKinny) and Kitty Oppenheimer (Bullock).